Social media is highly important when it comes to building a customer base and increasing sales. Sure, your exhibit booth can do this, but are those custom-designed banners doing you any good packed up in storage in between trade shows? Your social media accounts are like trade shows that run a full 365 days. Think about it – people want to learn more about your business, so they visit your “booth” (your Facebook page, for example), and if they like what they see, they head to your website to check out more information. When you read tips on using social media to benefit your business, you always hear about Twitter and Facebook, but what about the other options available to you? Here, we’re going to take a look at LinkedIn, what I like to refer to as “Facebook for professionals.” Recently, at ‘Social Media Marketing World 2014,’ Jason Miller of ‘LinkedIn Marketing Solutions’ spoke to the crowd about how LinkedIn provides businesses with an effective way at reaching out to prospective leads. What are some top tips Miller recommended? Let’s take a look. Be irresistible. This isn’t as difficult as you would imagine, but it is different than being irresistible on the trade show floor. At the show, you can employ visual techniques or promotions to pull people in. On LinkedIn, it’s your activity that counts. Just as with your blog, Facebook page, and Twitter account, content and interaction is key. Keep it fresh, and be sure you don’t just post all about your business. That gets old fast! Post interesting things that might relate to your business, and even include some things that don’t relate whatsoever. The most important thing to do, just as with your other social media networks, is to spend some time commenting on the things that others in your network are posting. But always be sure to remember that you are giving your brand a voice, so make sure it is communicating its message in a positive way. Build yourself a group. Groups within LinkedIn are a great way to build a following and reach out to those interested in your industry. It not only exposes your company to more people, it lets you interact with your customers and potential customers in a unique way. You have to be sure to post continually relevant content and ensure the conversation stays on-topic, so you might want to give this task to someone within your company to manage things. Don’t use this space to entice members to purchase your newest product. Instead, you can use it to answer any questions they have about that new product. Start some “just for fun” conversations – group members want to get to know those “behind the brand.” These off-topic conversations help portray you as a human, and not a company. It’s all about optimization. Just as with your web page, you need to be sure your company’s LinkedIn page easily draws people in. It’s the first impression visitors have of your business, so you need to be sure that all images and content is consistent with your brand and the message you are trying to portray. Be sure to use those keywords here, and include links to all of your social media pages and your web page. Take it to the next level with paid LinkedIn advertising. While it is true you don’t need to pay to use LinkedIn, if you are a business, it pays to pay for advertising on the site. Why is this? The main reason – it allows you to target your ad to ensure it reaches only those that want to see it. Or, if you’d like, it can reach a broader audience. Want to post a promotion that’s specific to New England? You can do that! Is your next ad to be available on a national scale? No problem! Be sure that your ads are offering things to the right audience, and that it is something they’ll have to have. Show off your number one fan. As Miller explains, social media differs in one significant way from traditional advertising. When you run a print ad, that ad is seen by an audience, chiefly whoever is interested in reading that specific magazine, for example. But with social media, you are running that digital ad that will be seen by an audience. In turn, that audience has its own audience, and so on and so forth. This is what makes social media so valuable. In order to get to those audiences of audiences of audiences, it’s best to start with an advocate, someone who will say amazing things about your brand, getting others interested and driving them to your brand’s LinkedIn page to check it out. You could start with your own employees or satisfied customers, letting them praise your company all over their social media channels. In time, it will pay off, and soon you’ll have many advocate minions without even realizing it. It’s word-of-mouth advertising on steroids! Crunch the numbers. Don’t ignore the analytics provided by LinkedIn (a new and useful feature). You’ll learn which topics are most popular with your audience, how your content is faring within the entire LinkedIn community, and compare you to your competition. You can tweak content using this data to keep your audience happy, and see if there are things you could be doing better. What’s more, it allows you to keep an eye on your competition! The analytics LinkedIn provides is a handy way to be sure your LinkedIn efforts aren’t in vain. 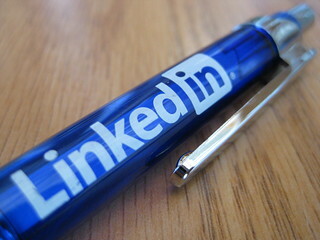 Are you using LinkedIn for your company? How has your experience been? What have you found to be more successful: LinkedIn or the trade shows?